We enjoy a daily sharing over Every Day Poems on Twitter, inviting you to take a dip into poetry with us. Perhaps for you, the poem could be a pool. You could take a dip, a refreshing soak of your arms, legs, and lashes. Or maybe you’re the more hesitant type, dipping in only a toe to test the waters. However you do your dipping, we invite you to keep taking your daily dip into poetry with us, posting your favorite line from the day’s Every Day Poems, with the hashtag #dipintopoetry. Today, we’re sharing the top ten (by number of tweets and favorites) #dipintopoetry lines that were tweeted over the couple of months. Sometimes that #dipintopoetry also inspires #everydaysketches. #everydayimages and #everydaysculptures. Photo by 白士 李, Creative Commons License via Flickr. 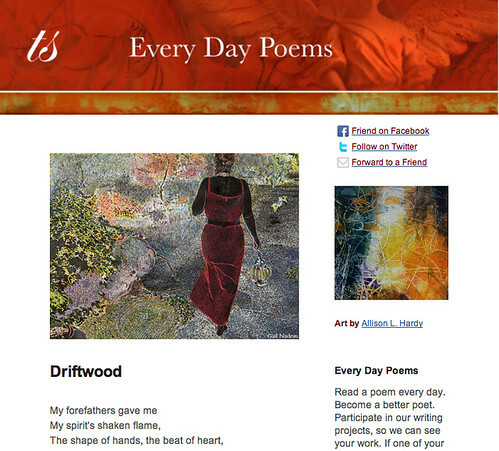 All poems previously appeared by permission of the poet and/or publisher in Every Day Poems.